The Larson Electronics Solar Powered Explosion Proof LED Light is an ideal lighting solution for remote areas and standalone applications where connection to external power is either impractical or unavailable. 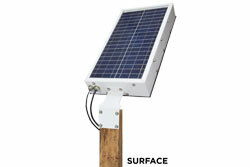 This explosion proof LED light is powered by a 8aH sealed lead acid battery that is recharged by a 30 watt solar panel. The light output comes from a 12 watt LED lamp that produces 1,600 lumens. The light runs for 12 hours when the battery is fully charged. Charging time for the acid lead battery is 5 hours when exposed to direct sunlight. Indirect sunlight will extend the charge time. This solar panel can be equipped with either a day/night sensor and a motion sensor or with an on/off switch. The day/night sensor is programmed to activate the solar panel in the evening and to shut it off during the day while the motion sensor will activate the panel upon detecting motion. The on/off switch will activate and shut off the solar panel according to the operator`s preferences. The operator can switch between modes with a toggle switch. 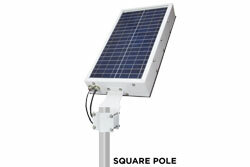 As with all solar powered equipment, charging time is affected by the amount of available ambient light. When ambient light levels drop below a certain level, such as on cloudy days, the unit will not recharge as quickly. The lead acid battery pack is contained within the solar panel, not the light. The illumination produced by the explosion proof LED light will cover an area approximately 55’L x 55’W when mounted 12 feet from the ground. Mounting options include ceiling, wall and pendant mounting for the lamp fixture and flat surface or round/square pole mounting such as on utility poles or structure supports for the solar panel. This hazardous area light (Lamp Fixture only) is UL Listed Class 1 Division 1, Groups C and D, Class 1 Division 2 Groups A, B, C, D, and Class 2, Division 2, Groups F and G. These lights are also compliant with NEMA 4X standards and marine-rated for use in salt water environments. The high power LED cluster is protected by an internal cooling fin array that reduces heat build for longer LED life and higher light output consistency. An internal DIP switch allows operators to choose from steady on, single flash or double flash modes. This explosion proof LED light contains a LED bulb that can serve to illuminate small works areas or draw attention to towers and other structures from a distance. This explosion proof LED light can be configured for steady burn or strobing applications. The housing on this LED light is constructed to NEMA 4X standards and is marine rated for salt water environments. The cast aluminum housing is made of high strength copper-free aluminum alloy with a baked powder epoxy finish and is shown with a wall mount configuration, but can be configured with a pendant or ceiling mount as well. The fixture ships with 600 feet of #4 SOOW cable and custom lengths are available upon request. Please contact us for special requirements. Larson Electronics offers a Class I, Division 2 rated panel solution for an additional cost. This incorporates a class rated panel, charge controller, and sealed battery solution. This allows the panel to be installed within C1D2 environments. No C1D1 rated solar panels exist, so the panel must be located outside the C1D1 environment in either panel solution offered. Birds, such as pigeons and geese, as well as common wildlife pests that make their way into residential or commercial locations, including beaver, raccoons and foxes, can be difficult to ward off without the right equipment.